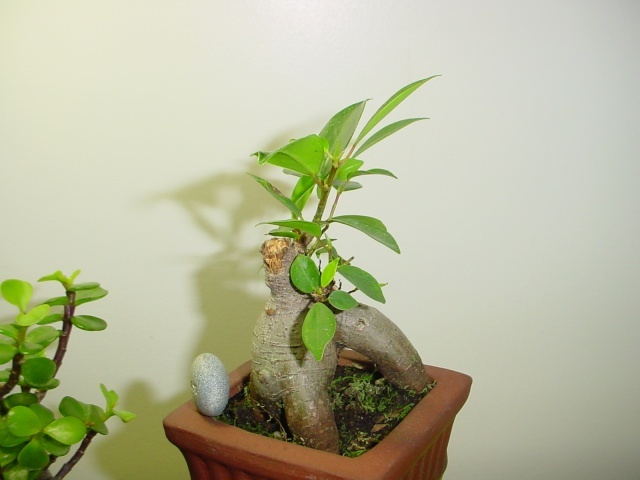 Are there any tips on encouraging new growth on specific areas of the trunk of a Ficus? It is fairly young and all the branches and new leaves only seem to be growing on one side of the tree...I would like to try and balance it out but is their such a thing that could encourage buds to grow on the other side? If you look at my previous posts you'll see the tree in question... but I've since removed the moss and discovered a new shape at the bottom of the tree. I know I've seen medicinal clay used for grafts or healing trunk abrasions but could this also be used if wrapped on a certain part of the trunk to promote new growths? Thanks for any tips or ideas even in future shaping of the tree I would certainly love to hear ideas. Pinch, pinch, pinch. Cut back new growth on the top and you're likely to get growth elsewhere on the tree. If it doesn't pop where you want it, rub it off and wait until the next one, or the next. You can't really say "I want one right THERE" and expect it to listen . Pinch, Pinch it will be thanks Jim. I guess I was on the wishful thinking path that there may be a product out there similar to "rooting powder" but that would be made to promote new limbs on trees by inserting the powder it in a cut...similar principals as grafts without inserting a new limb. Promoting growth a bit like when cutting back a trunk but instead only making a small incision on the trunk where new growth would be encouraged by a product that would be applied on the incision. Maybe the tooth fairy (tree fairy) would leave me the recipe if I put a leaf under my pillow tonight hehe! 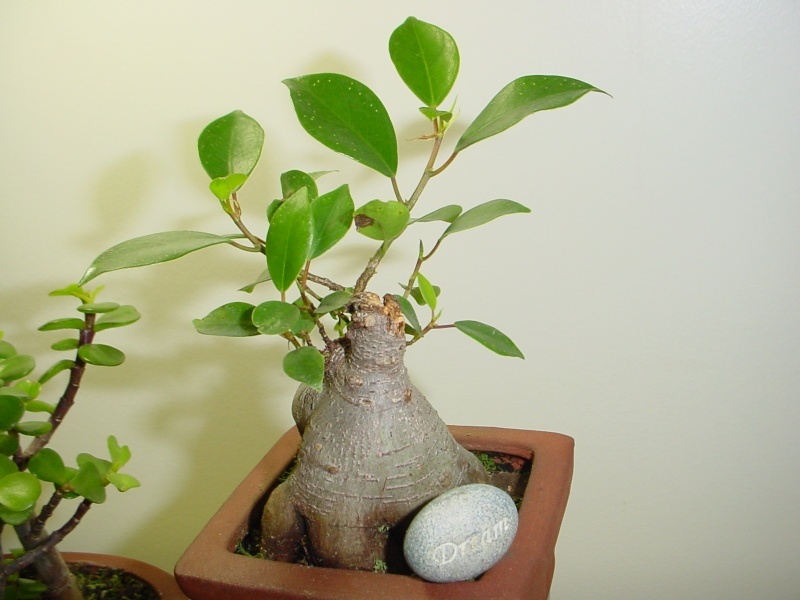 Sorry to disappoint you, but what you have is what they call a ginseng ficus. The massive part is a tuberous root. It will not produce any branches. 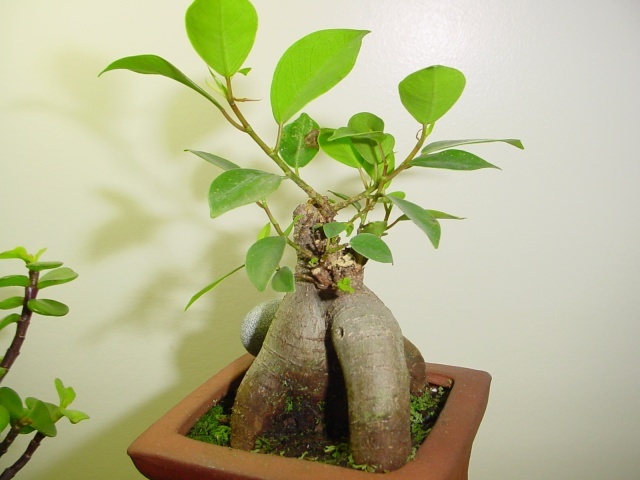 If you want to get anything like a bonsai out of it, plant it in coarse soil in a very large container, and encourage the top part to grow a foot or two tall. To be honest, I would grow it as a houseplant and find some more suitable bonsai material. It is greatly appreciated...I must admit that I was a bit muffled at what to do with it as a Bonsai...I've seen pictures but it was not the type of look I was hoping for...I'll still give it a good try hehe! I would remove the one higher up tuber and use the remainder as a sumo trunk. The last pic would then be the front. The remainder trunk can be root layered later on to develop secondary roots. After a while the tuber trunk will the same a a normal trunk.